Though not my favorite hero of legend, I was intrigued by the title of this book by Edward S. Louis. 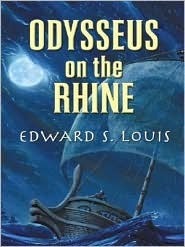 Odysseus on the Rhine imagines the further adventures of Odysseus and other veterans of the Trojan War in this solid, entertaining “sequel.” Even those not familiar with their mythology will find this fantasy accessible. If it’s anything to do with Greek Mythology, I’m bound to take a look at it, and when my library started circulating this book, I was virtually first in line. Now for some reason, I’ve never been much of a fan of Odysseus. The wily Greek King of Ancient Ithaca, featured in Homer’s epics, never quite enthralled me. He and Hercules are, in fact, my least favorite heroes from the Greek pantheon. Still the plot of this novel, set up as a sort of sequel to The Iliad and The Odyssey, grabbed my interest. I would draw particular attention to this line of the book’s description: “Diomedes arrives to tell him of surviving Trojans who have settled in the far north, a land of golden-haired women, and set themselves up as gods.” The allusion to Norse mythology was irresitible as was the mention of Diomedes. Though lesser known, Diomedes was considered second only to Achilles as the greatest warrior of the Achaeans (the Greeks). He is known for wounding two Olympian gods, Aphrodite and Ares, and, together with Odysseus, stealing the Palladium, a holy relic, from the city of Troy. My interest in him stems from a little known anecdote in Robert Graves’ book, The Greek Myths. In the notations of chapter 148, Graves cites: “The myth of Pelias and Diomedes–Jason’s original name” … and later … “who won the name Jason (‘healer’)…” This factors into a story of my own devising. More on that in a later post. The story in Louis’ book begins after the passing of Odysseus’ beloved wife Penelope. Diomedes arrives, bringing news of Trojans in the far north, and convinces Odysseus to come to Calydon, where other Achaean veterans of the Trojan War have gathered. They will venture west and then north, encountering the Sibyl of Cumae and the Germanic legend that is Lorelei, and are accompanied by the now mad–and prophetic–Orestes. Their journey is frought with adventure–grounded in a mythic reality–that has a ring of plausibility. “Asgard”–appearing on the convenient map included in the book looks to be situated near Goteburg, Sweden–here, Odysseus and his companions encounter Tror (‘Thor’) and his son, Lokesh (‘Loki’). Does Odysseus’ name remind you of anyone? My knowledge of Norse mythology is not as strong as I’d like, but Louis weaves a tale that could pass as the foundation of what would evolve into the Norse legends as we know him. This creative blending makes for an interesting read. It also relates to another interesting theory I’ve read, another item for a future post. For those who may not be as familiar with the mythology and folklore, the Sibyl of Cumae is the seeress cursed by Apollo to live along life while slowly dwindling to nothing but a voice. She features in Virgil’s The Aeneid, in which the Trojan hero Aeneas flees the sacking of Troy and comes to found the city that will one day become Rome. Known as a bewitching female who lures men to their death, the Lorelei was inspired by the murmuring rock along a narrow section of the Rhine near what is now St. Goarshausen, Germany. Her legend actually dates from a poem, written in 1801, by Clemens Bretano, but she harkens back to such creatures as the Sirens of Greek myth whose song lured sailors to their deaths. Finally, Orestes is the tortured young man bound by duty and honor to avenge the murder of his father Agammemnon. Unfortunately for him, his father was murdered by his mother Clytemnestra and by killing her, Orestes incurred the wrath of the Furies, who punished those who violated laws of family piety. He really couldn’t win either way. The Delphic Oracle advised him to avenge his father’s death or become an outcast. Killing his mother resulted in the same fate. At least, until he was purified after a trial in which he was acquitted. Though available commercially, Odysseus on the Rhine is published by Five Star which mainly markets direct to libraries, so check your local library for a copy.